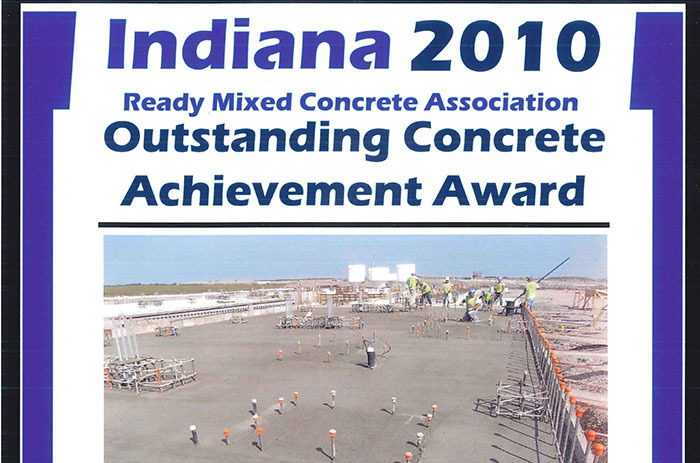 Robinson Construction Company was recently presented with the IRMCA (Indiana Ready Mixed Concrete Association) Outstanding Concrete Achievement Award for work completed at the Peabody Energy Bear Run Mine located in Carlisle, Indiana. Peabody Energy Corporation is the largest private sector coal company in the world and the Bear Run Mine is the largest surface mine in the eastern US. The project team included Peabody Energy Subsidiary, Taggart Global, Inc., Hayward Baker, Steinberger, Patterson Horth, Mike Dover Corporation, San Con, Irving Materials, Inc. and Robinson Construction Company. IRMCA presents these awards to recognize extensive application or imaginative use of concrete; and to honor the accomplishments of project owners, architects, engineers, contractors, owners and ready mixed concrete producers.